It feels like such a long time since I've blogged. I've been really busy these past few days.. and really stressed out lately. I have very exciting news coming up, but I have to wait until it's confirmed before I say anything T_T I'm really hoping I get a response tomorrow so I'll let you guys know! Anyway, today I thought I'd do some OOTD photos. I have finally moved my mirror to my room so I can take OOTD photos more often now! Other than that, hope you guys have a great week! Well, good luck on getting the news... The second outfit is probs my favorite, but the third is adorable too. I just love suspender shorts. i love liz lisa! ugh! so jealous! ahaha! wish i had access to it in the UK! Liz Lisa clothes look so adorable! 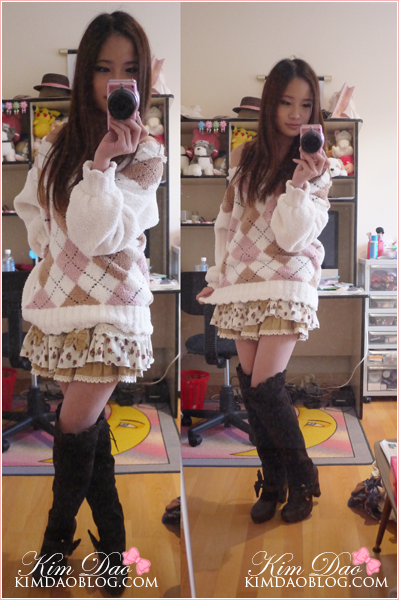 \(>0<)/ I love the sweater in the second outfit. It looks so cute on you! I really love your Liz Lisa sweater!!! !